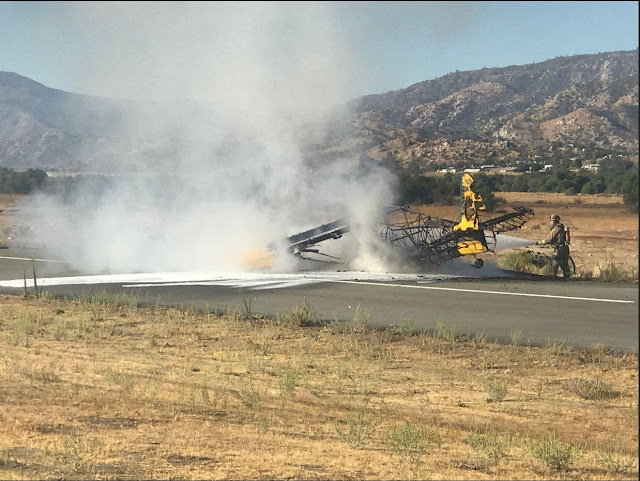 On September 30, 2018, about 0844 Pacific daylight time, a Howard Aircraft DGA-15P, N9471H, was substantially damaged during a forced landing at Kern Valley Airport (L05), Kernville, California. The airline transport pilot and passenger were not injured. The airplane was owned and operated by the pilot under the provisions of 14 Code of Federal Regulations Part 91. Visual meteorological conditions (VMC) prevailed, and a flight plan was not filed for the local flight, which was originating at the time of the accident. The personal flight was destined for Bakersfield, California. According to the pilot, he was returning home after attending a fly-in event at L05. After waiting for the engine oil to warm up to 60°C, he taxied the airplane to the airport run-up area and ran the engine up. During this time, he checked the rpm drop between magnetos, verified that the carburetor heat functioned normally, and cycled the propeller. After completing the run-up checklist, the pilot selected the center fuel tank, which was about 3/8 full. The forward tank was about half full. He then waited about 10 minutes for the traffic pattern to clear and then entered the active runway where he began his takeoff roll. The airplane lifted off the ground about 70 mph and accelerated to about 85 mph in a 10° nose high attitude. 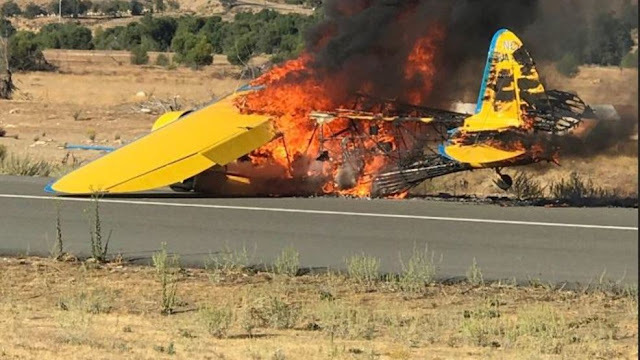 The pilot recalled that the airplane reached about 50 ft above ground level before he encountered a total loss of engine power and started to descend rapidly. The airplane impacted the runway, both main landing gear separated and the airplane slid about 300 ft before it came to rest. The airplane was destroyed by postcrash fire. A video of the accident flight furnished by a witness corroborated the pilot's statement. 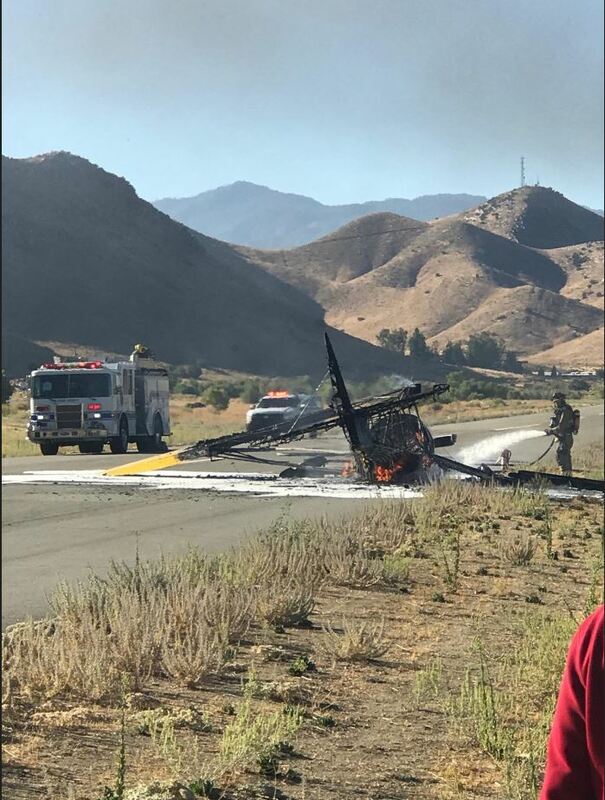 FRESNO, Calif. (KFSN) -- Kern Valley Airport was shut down for several hours on Sunday after a plane crashed and burst into flames. 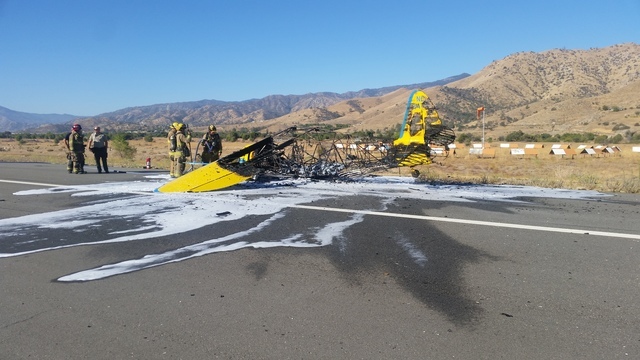 Two people were inside of the plane when it went down at around 8:30 a.m. in Kern County. Photos from our sister station in Bakersfield captured the aftermath of the crash. Fire crews say both occupants got out of the plane without injuries. The Federal Aviation Administration is working to figure out what caused the crash. Glad all got out ok. There were 20+ pilots on the ground watching the airplane take off in the morning as part of a fly-in that weekend, including myself. I was less than 100 feet away when the accident happened. As pilots we all saw and know what happened and it wasn't an engine failure or any issue with the airplane. Tell us what happened? Groundloop? The pilot was showing off and rotated way too early on take-off, stalling the airplane about 30 feet above the runway and it came crashing down hard breaking the landing gear and sliding to a halt on the belly. Howards have the fuel tank on the belly so a fire broke out and it took the airplane. There was nothing we could do but watch it burn. I think we all understand people make mistakes and it's not about throwing people under the bus, but the pilot is a chief pilot for a local charter with presumably several thousand hours of time. It's really inexcusable to pull a stunt like that and destroy a beautiful airplane. The runway is 3500 feet long with no obstacles and it was 8:30 a.m. with clear skies. It was a matter of a guy's ego getting in the way of safe flying and consequently destroying one of less than a hundred of these birds left. Not to mention stranding 40+ airplanes for 8 hours on a Sunday when people needed to get home because the runway was closed. We're all glad nobody was hurt, that's obviously the most important result. It just seems we need to be honest about what happens with these accidents and not cover them up because we're afraid of the NTSB or FAA. If a person pulls a stunt like this they should be held accountable so they get the additional training they need to make sure it doesn't happen again. We should all support safe and smart flying. I wonder who will finally break and post the video.... multiple people have it. Dangerous behavior has no place in our sport. We were stranded. We all know what happened. I wonder when someone will finally man up and post the video..... she was still making power until the blades ate the asphalt. It’s amazing that nobody else on the ground got hurt. Making a false statement is highly illegal. "Dangerous behavior has no place in our sport." "We should all support safe and smart flying. "It’s amazing that nobody else on the ground got hurt." ...says the human standing next to the runway with 20+ people filming it. Boy, if this isn’t throwing somebody under the bus I’d like to know what is. This person has suffered tremendous consequences already. Is the piling on really necessary? I’ll be sure to never screw up at L05. By that I mean that I’ll not bother to visit. We’re supposed to be a supportive community, not a lynch mob. Stones and glass houses come to mind. The motor quit. I heard it; I watched it. It was not making power when it hit; and it wasn't for a good few seconds before ground contact. No exhaust noise, just the sounds of a aircraft gliding and a prop windmilling. I was closer to it than anyone else at the time and could hear it distinctly go from full power to none. The sounds of a 985 quitting cold turkey on takeoff still haunts me whenever I hear one takeoff.